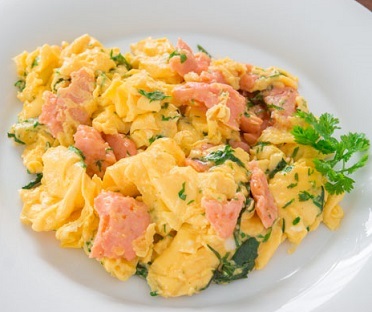 Memories are waiting to be made with this Scrambled Egg Recipe with Smoked Wild Salmon! This restaurant breakfast recipe was first used on a holiday. The customers raved about it and the restaurant recipe became a frequent special on Sunday menus. I am fortunate to live in Washington State (USA) because of the variety of quality products readily available. This is an easy recipe but the secret is using quality wild smoked salmon. Scrambled eggs should be soft and moist unless you like them "scrambled hard" like my dear husband. 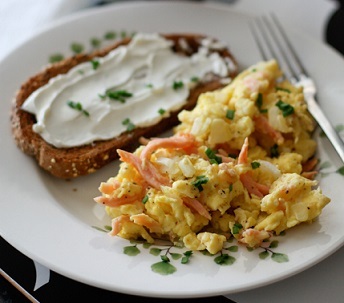 This scrambled egg recipe with wild smoked salmon is also a great low carb breakfast so long as you serve it with the appropriate accompaniments. Preparation time: 5 minutes. Serves 4. If you wish, you could add a piece of your favorite cheese on top. I love a slice of Norwegian cheese as a delicious enhancement. You might also want to serve this restaurant scrambled egg breakfast recipe with an Orange Frappe' or a Midori Margarita! Or a glass of Champagne! Enjoy your real restaurant recipe and the company of those you share it with! "Salmon. It really only exists on the Western side of the Cascades."